Ha! Didn’t think I’d be back with a new show so soon did you? Yup, another time travel piece! Tragedy strikes just as Peng Zhen Dong and Xie Jia Xin are starting an exciting new chapter of their lives. Now ten years later, a totally changed Peng Zhen Dong appears again as an unrecognizable Han Ruo Fei. He receives a camera left for him by his wife to time travel and possibly rewrite history. You know it’s bad news when you have mom (Zheng Mei Ying) calling son (Peng Zhen Dong) on the phone to tell him some “good news” in the first scene. It’s even worse when she’s all like oh no worries, we will chat when you get here. And of course, when her son does arrive? BAM, explosions galore. Our protagonist falls into the water and whomp whomp, presumably dies. Geez, what an introduction huh? I guess they have to jump into this quickly to get the whole story going. We do have time travel coming up after all. But before we get there, we are told that the Heng Yuan Food Corps. is under fire for incidents of food poisoning. The subsequent death of CEO Zheng Mei Ying and her son Peng Zhen Dong in the explosion are considered suicide. 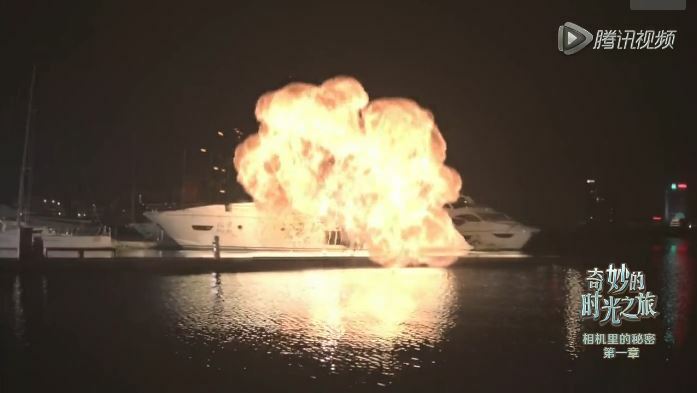 If they really trying to commit suicide, blowing up their yacht is certainly one way to do it. Now two months later, we are taken to a hospital where Peng Zhen Dong is at though none of the medical staff knows who he actually is because his face was severely burnt. Fortunately for him, someone donated their entire face upon death and they’ve been able to successfully put it on him. He asks the doctor about Xie Jia Xin, his wife, and the doctor tells him she died recently in a car accident. Dang, imagine waking up to that. So as a result, he decides to forgo his former identity and take up the name of the person who owned his face before, Han Ruo Fei. Well, at least he doesn’t have amnesia, right? Drama trope #101 avoided. Flash forward ten years and Ruo Fei bumps into Song Qiao Qiao, his deceased wife’s #1 and now, only fan. She’s staging some sort of demonstration at the airport, hoping to revive people’s love for Jia Xin. Ruo Fei is intrigued, and Qiao Qiao explains that she was saved from falling into the gutters by Jia Xin at a press conference years ago and so from that day on, she has decided she will be Jia Xin’s fan forever. Ok, girl. While they are chatting, Ruo Fei’s bff Wu Yao (he knows Ruo Fei is Zhen Dong) arrives to pick him up. Wu Yao cannot believe what Ruo Fei looks like now and starts poking at his face. Upon seeing this, Qiao Qiao misunderstands their relationship and rushes off after wishing them happiness together. LOL. Shortly after, Ruo Fei gets a call from his assistant, Ah Ken, who is on his way to sign a contract with Pan Zhi Yong in order to purchase Heng Yuan Food Corps. Pan, Zheng Mei Ying’s former assistant, took over the company after her and her son’s deaths. In addition, Pan used the company as a springboard to create a new conglomerate named Jin Feng. Because Pan is the only one who benefitted from this whole thing, Ruo Fei suspects that he has something to do with all the “accidents.” Therefore, he tells Ah Ken to keep the phone on so he can listen in on the conservation. Instead of reviewing the details of the contract, Pan Zhi Yong keeps on inquiring about Ruo Fei, the “mysterious CEO” at the meeting. Ah Ken successfully dodges these questions until someone walks in and interrupts the conversation. Guess who? Qiao Qiao! Apparently Pan Zhi Yong had promised her mom that he would take care of her. And why is she there? She just found out that he transferred some money to her account and she’s unsure why. Yup, they are randomly having this conversation while Ah Ken is still in the room. Where’s your professionalism, Mr. Pan? As if he suddenly notices the inappropriateness of his behaviors, Pan quickly signs the contract without looking and sends Ah Ken out the door. To be honest though, he doesn’t really have much to complain about because Ruo Fei offered him twice the market value for Heng Yuan Food Corps. Why the high price? Ruo Fei wants to test Pan – if Pan is the suspect then he would feel iffy about the whole contract, but if not he wouldn’t mind signing. Uh… not sure your logic works, but ok.
After the deal is sealed Ruo Fei directs Wu Yao to the site of his upcoming restaurant where he points out that one of the workers there is Zhao Wu, the driver who killed Jia Xin. He had hired Zhao Wu right after the man was released from prison (like literally, offered him a job in front of the prison), so he can figure out what happened years ago. However, despite how much they probe Zhao always insisted that it was an accident. isn’t this just a little bit weird? As the day nears the end, Wu Yao drops Ruo Fei off at his home – the same place as ten years ago. While there, Ruo Fei asks Wu Yao to hit up a local bar later. Wu Yao takes this as a sign that he is ready to move on, but who knew that Ruo Fei just wanted to go there to return a notebook to Qiao Qiao? Yup, in her rush to get away earlier she left behind her precious journal that documented all sorts of news related to Jia Xin. And Ruo Fei knows where Qiao Qiao is because he had Ah Ken find out. Right, because stalking is just this easy. Drama trope #134, not avoided. Anyway, Qiao Qiao follows Ruo Fei home and is surprised to see where he lives. Ruo Fei gives the notebook back to her and requests to join her one-person fan club. She’s unsure of his motives though (she thinks he wants to date her), but when he adds that he can sponsor a memorial party for Jia Xin, Qiao Qiao is all smiles. Of course, Ruo Fei is not genuinely interested in Qiao Qiao; he only wants to use her to get close to Pan Zhi Yong and the truth. After sending Qiao Qiao off, Ruo Fei treats us to a flashback of how he met Jia Xin for the first time. She had accidentally stumbled into his room after getting drunk (no locks on these doors I guess). When she came to, he was about to get beat up by some guy who was convinced he got their boss’s daughter pregnant. She knocks the guy out with a wood stick and the pair makes a run for it. As soon as he gets the chance, Zhen Dong quickly explains that he is in Tokyo because his mom set him up with the daughter of a prominent Japanese family. He has seen the girl a total of two times so there was no way the child is his. Jia Xin suggests that they report it to the police, but he says it would too rude of him to expose the girl to the public. Now that they have formally made acquaintance and narrowly escaped doom, Zhen Dong remembers Jia Xin had drunkenly asked to go see deer earlier. He offers to drive to Nara and she happily agrees, saying that she knows the directions. Except… she doesn’t. They get lost and instead of using their phones to find somewhere to go, they decide to spend the night star gazing! He also shares with her how his mom thinks of him as this good for nothing, who spends his time playing instead of helping her with the family business. Jia Xin disagrees immediately with his mom, saying that he is a good person and his “playing” is more than that – it is a hobby (referring to his interest in photography). Zhen Dong: in that one moment you understood me, and in that one moment I fell in love with you. Back to present day, as he leaves to meet up with Qiao Qiao to discuss the party Ruo Fei stops by the old mailbox. Though initially hesitant, he opens it to discover a letter from Jia Xin in a secret compartment. The letter details the location of a gift from her and he immediately goes to retrieve it. When Ruo Fei gets there, he finds out the address she leads him to is that of a camera shop. She had purchased this mysterious camera they saw together at an exhibit in Tokyo. The shopkeeper was also at the exhibit and had told them that the camera was found on a sampan near the Bermuda Triangle, and people think it is from the future. No one has been able to figure out how to operate it, but somehow Zhen Dong was able to do it on the first try. Along with the camera also came a letter from Jia Xin congratulating him on finding the gift and asking him to take a selfie to show her. Ruo Fei picks up the camera, installs the film and clicks. Ruo Fei: lao po (wife), I’ll take one for you. Haven’t had enough? Click here for episode 2! Wu Yao asks Ruo Fei when will he move on from Jia Xin and he answers that he never will. Awwww! Ruo Fei has been in America all these years, making it rain on Wall Street. Wu Yao and his wife Xu Xiao are divorced but they still live together. The only thing that’s different? They don’t sleep in the same room. Wu Yao is a crime/mystery writer. While talking about the old mailbox in front of Ruo Fei’s house, Wu Yao references the time travel movie The Lake House. Ruo Fei tries to convince the shopkeeper that he is Zhen Dong and he is supposed to retrieve the camera, but the old man is hesitant because they don’t look the same at all. So Ruo Fei proves it by operating the camera again like he did ten years ago. Hi Estelle, been a while. Thank you for this lovely review. Guess it is time to get back into my c-drama land whenever I could. Been extremely busy. This drama sounds like an interesting one. Will check it out soon and hopefully it is avail in my region. I’ve actually skipped Les Interpretes. I guess now I’ve recheck it.